Despite a few seriously annoying bugs, the Windows 7 version of Windows Media Center is without a doubt the best yet. I think my only real complaint is with Microsoft's shift from the DVR-MS format to the newer WTV format for recorded TV shows. WTV files are incompatible with the XP and Vista versions of Windows Media Center and Windows Media Player. In other words, if you want to watch recorded shows on the older PCs in your house, you're sorta outta luck. 1. Open your Public Recorded TV folder. 2. Right-click the recording you want to convert. 3. Choose Convert to DVR-MS format. Tricky, huh? The process will probably take anywhere from 5-30 minutes, depending on the speed of your computer and the length of the show. When it's done, you'll find a DVR-MS version of the recording right below the WTV one (the latter doesn't get altered in any way). Look for a -DVRMS suffix added to the filename if you can't tell which is which. 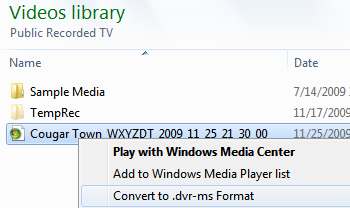 Now you can copy the DVR-MS file to your laptop or any other system running XP or Vista; it should play just fine.